I combined yesterday's dog walk with a bit of autumnal hedgerow foraging. The blackberries were eaten at dinner last night and breakfast this morning, but the sloes have a more exciting fate awaiting them. Remove the stalks and wash the sloes. You can then either prick the sloes at each end with a cocktail stick to release the juices or freeze them on a tray overnight (I freeze mine). In the empty gin bottle add 250g sloes, 125g sugar and 350ml of gin. Seal and shake vigorously – I am talking a FULL body shimmy here, you should feel all your wobbly bits wobbling (I do!). Repeat with remaining ingredients in the other bottle. Shake each bottle vigorously, twice a day for at least 2 weeks, this is as good as a gym workout, especially for bingo wings. After two weeks the liquid will be dark red and the sugar will have dissolved. Leave in a cool dark place to mature – although ready to drink after a few weeks it will improve with age and is best left for a year. I leave the sloes in the bottle, but you can strain and rebottle after 3 months. 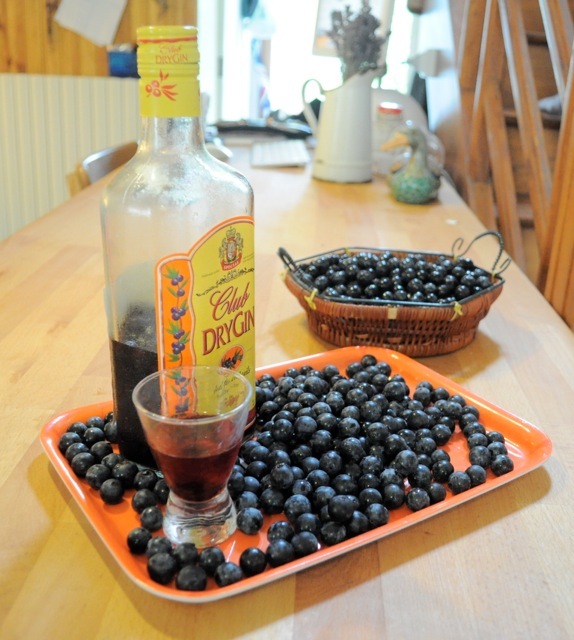 Sloe gin is a lovely fruity apero drink, but also enhances stewed plums, pears, baked apple or quince and makes a fruity alternative to Cognac in our mulled wine at Christmas. Mmm yummy, I love sloe gin! !